Yes ! You need it. A little feedback about Spice simulation, at first I was a little skeptical. My first spice schematics was not that good because of « bad » models (understand Ideal models), but more recently at my work I had to use it before prototyping some « complex » analog board (Fet, Transformer, High Voltage, HF) and after many research I manage to have a better overview of the Spice Engine capabilities (LTSpice to be precise). In fact, if you want to have a mV precise simulation you MUST fetch your components models from the manufacturer (or do it with the help of datasheet but it’s a lot difficult). 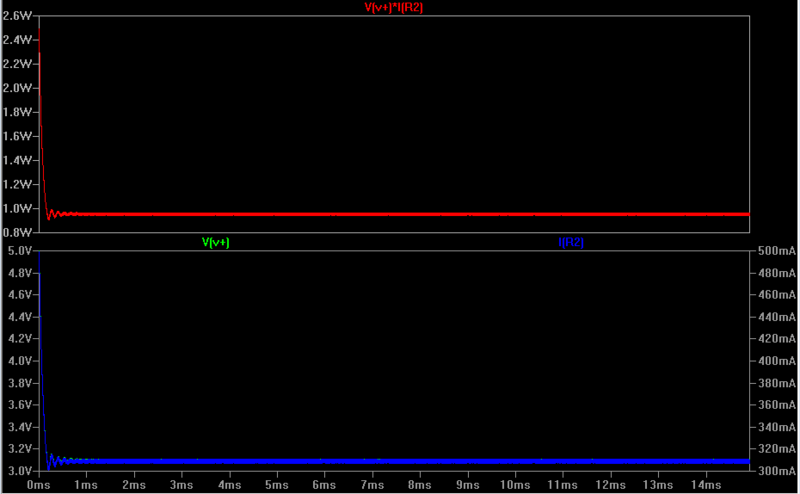 It’s particulary true if you want to simulate things like HF oscillators, amplifiers and other thing in this domain. 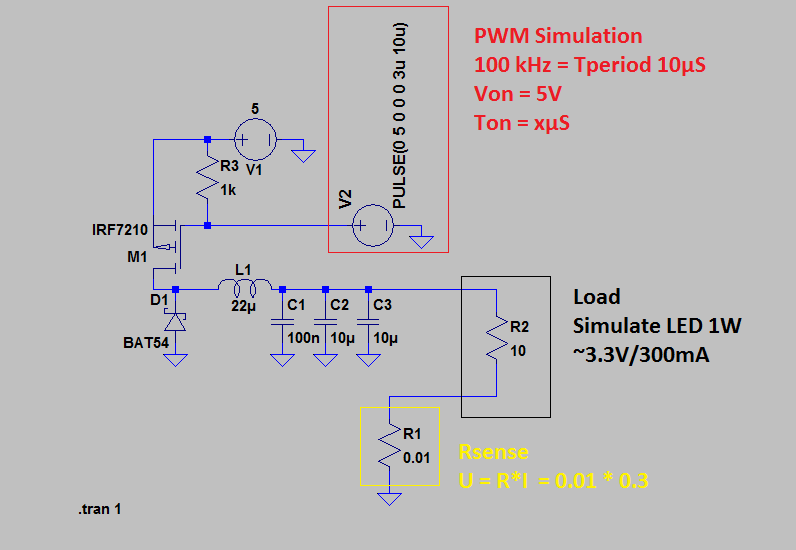 In the case of my Current Regulator, I’m lazy and I’ll go for the first simulation with simple model, because constraints are not so importants and I’m not borred by the idea of doing the prototype many times ;) In fact, I just want to see If my « concept » with these values has a chance to work. The first problem in this case (and the only one in fact) is « how to do a PWM without modelling the µC ». 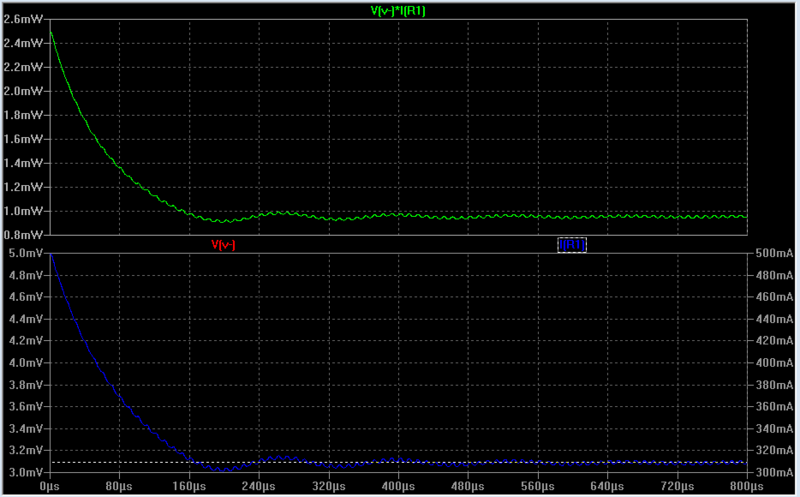 The solution is really simple, just use a Voltage Component in pulse mode. 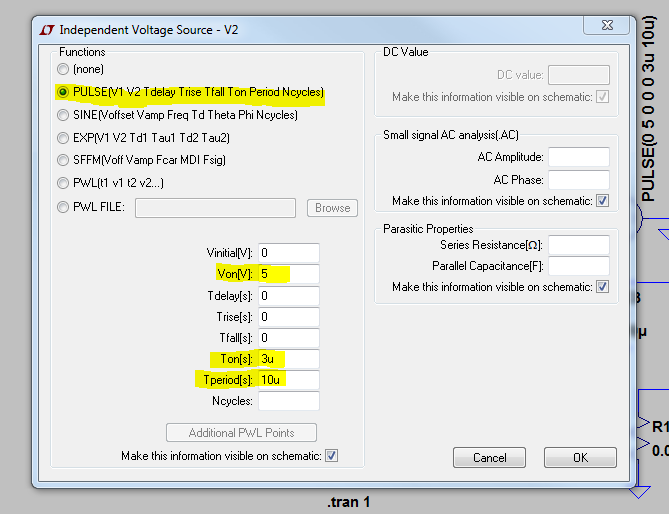 As you guess modify it for your need (Remember F = 1/T ;)) For the test I’ll take Ton = 3.5u because 5*65% = 3.25V, so if the simulation goes well it should be good. I made a little change before launching the simulation, the Schotkky Diode will be a MBRS340 and the model is already in the default lib of LTSpice so I took it (moreover the diode is one of the most important part in this design). 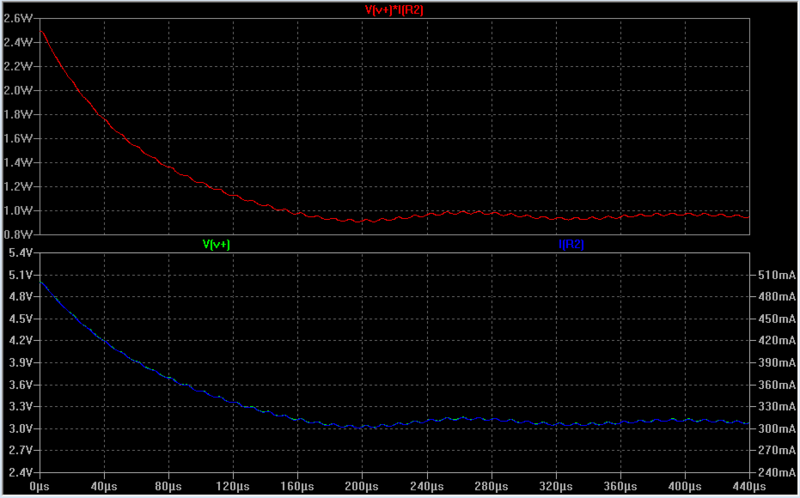 I placed a V+ net flag on the top of the load and a V- net flag between load and sense resistor. First check… Seems « Not Bad » ;) If you don’t know you can add « computed » traces, just right-click on the graph and select Add Traces. You can type your equation in the textbox. 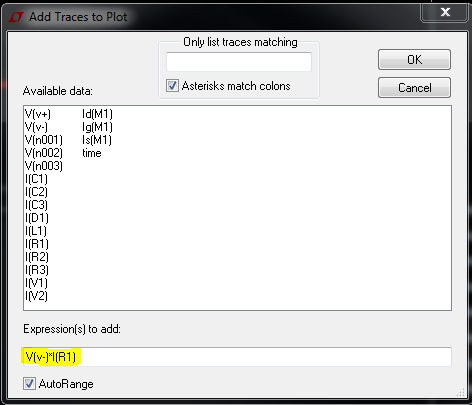 (For easier read you can use Add Plane to add a panel in the graph area). 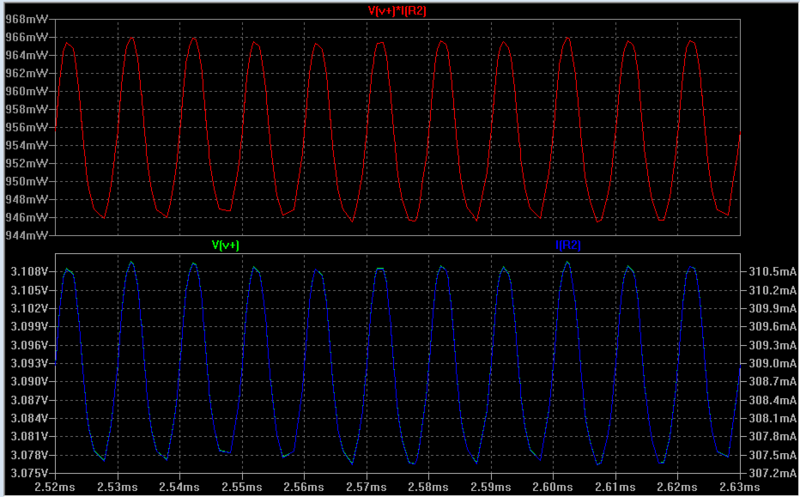 In this example, I added the Power dissipation of the Sense Resistor. As you can see we have about 956mW, a 40mV / 3mA Ripple, we could have better results, but I’ll do the fine tuning on the protype or if I’m not too lazy on a simulation with real and correct models ! As I said, I’m worrying for the transient voltage accross the LED the first 120µS are a little too hard for the device I think, I’ll investigate on the Internet, and if necessary, I’ll add a snubber. Your advices are welcome ! There should be no problem here, but to be sure just take a look at the voltage drop and the dissipated power in the sense resistor. Ok, everything seems normal hopefully. So, what to say in conclusion, first all the results here could have been (hand)calculated but honnestly it tooks me 2 minutes to draw the schematic and launch the simulation, I agree there are some differences with the real board, but it shows me before, maybe, frying my LED that I should take care of this transient, and gave me an idea of how much power will be dissipated. For more complicated board it will save you much time if you did a stupid mistake or design error. Publié dans Electronique, Spice.Tagué current regulator, led, ltspice, simulation, spice simulation.